Wishing all of you a very Happy & Joyous Navratri (a major festival celebrated all over India)! Wash sago (sabudana) two to three times and then soak in a cup water for three to four hours (Depending upon the type and quality of Sago (Sabudana), you might need to soak them for less time or more). Sago (Sabudana) grains should be moist. Drain well and keep aside. Peel the potatoes and cut into small cubes. Roast peanuts on a hot griddle, peel off the skin and then grind coarsely. Heat ghee in a pan, add curry leaves, cumin seeds and chopped green chillies. When cumin seeds crackle add the potato cubes. Cook till the potatoes are done. 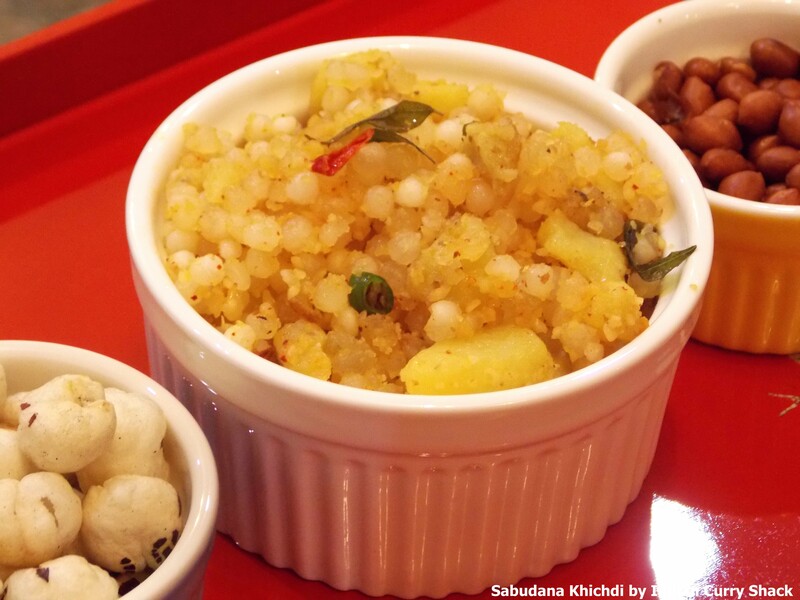 Add sago (sabudana) and ground peanuts, sauté for four to five minutes. Add salt and lime juice. Mix well. Remove from heat. Garnish with chopped coriander leaves and serve hot with curd or mint/coriander chutney or simply with lemon wedges. Happy Navratri! This looks wonderful; thanks for sharing! Happy FF, and have a wonderful weekend!